“In our culture, we take care of our parents at home,” says Pilar Cook, a Latina who cares for her 80-year-old mother at her Westminster home. A new Caregiver Project launched in 2013 is working to understand the unique challenges faced by Latino caregivers like Cook. The project is one of many efforts underway by the Latino Community Foundation of Colorado’s Colorado Latino Age Wave, a Rose Community Foundation initiative focused on the well-being of Metro Denver’s growing Latino older adult population. Focus groups with caregivers are helping identify promising practices and promote public policy changes that help reduce the stress on Latino family caregivers and their elders. “Taking on the role of caregiver is a life-changing decision and many of us find ourselves overwhelmed,” explains Cec Ortiz, Colorado Latino Age Wave project manager. 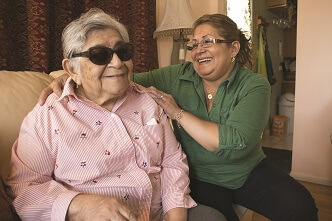 “Through the focus groups, we’ve encountered three dominant challenges faced by Latino caregivers – transporting elders to receive services, finding information about existing services and sheer exhaustion. We’ll be working to address each one of those over the coming months and years.” Stay tuned for a Caregiving Project summary report, including findings and recommendations, to be released in 2014. Colorado Latino Age Wave is a multi year project of the Latino Community Foundation of Colorado, an initiative of Rose Community Foundation, in partnership with Hispanics in Philanthropy and with support from the Colorado Health Foundation and Community First Foundation. Learn more about Latino aging issues on our website at https://rcfdenver.org/what-we-do/programs-and-initiatives/colorado-latino-age-wave/. Get involved in Latino philanthropy at rcfdenver.org/latinocfc. Support our work in Latino aging by contacting the Latino Community Foundation of Colorado at cmartinez@rcfdenver.org or 303.398.7448.